1. What type of license or certification do I need to become a professional lash artist? Please be advised that every state has it’s own unique regulations. In the state of Florida, you are not required to have a special eyelash extensions license however you are required by the department of professional regulations to have one of the following state licenses: Facialist (Esthetician), Cosmetologist, Full Specialist or a Medical License (including RN). For requirements in other states, please feel free to contact us and we will be able to assist you in finding the proper information. After receiving the Pearl Lash Certificate of Completion you will be required to obtain one of the state regulated licenses stated above before you can work professionally. The Pearl Lash Certificate of Completion without one of the above stated licensed does not permit performing eyelash extensions professionally. According to the Florida department of professional regulations, a person can obtain a Facialist (Esthetician) license without a GED as long as you have reached the age of 16 years old. For additional information please read our “How To Become An Eyelash Artist” article or “Esthetician License From A Trade College” article. 2. Can I register for the Volume Training Class without first attending the Classic Training Class? We strongly recommend for all our students to have some real life eyelash extension working experience before proceeding with Volume Training. If you are just beginning on you journey to become a professional lash artist, you are strongly encouraged to attend our Classic Training Class before proceeding to Volume. Classic Training will cover all aspects of eyelash extension artist experience, starting from customer interaction and medical consultation, choosing the right products, forms and techniques, as well as many other basic requirements that every lash artist must know before indulging in the world of eyelash extension artistry. Please remember that proper education from the beginning will help you become a master at this craft. 3. What can I expect during the training? What is included in the price or your training? All of our classes will be divided into two portions. The first portion of the class is called the “Techniques” portion where our trainer will cover all aspects of lash application techniques, various styles, product options, client consultation and walk you step by step through the real world client experience. Each student is provided with a detailed study guide that will walk them through the techniques portion of the class and allow them to take notes and perform several practice assignments. Each student keeps their study guide and is encouraged to reference this guide as they continue to practice after completing the class. The second portion of the class is the “Hands-on” portion. In this portion, each student will require to bring a model (look in the “Do I need to bring a model” section of the FAQ) who will be with your for the second part of the day. During the hands-on portion all students will be provided with a supply kit to use in class that will include everything needed to start working on your model’s eyelashes. Our trainer will help each student with one on one attention and consult each individually throughout the entire process. 4. Do I need to bring a model? You are strongly encouraged to bring a model with you to the hands-on portion of the training only. Please note that models will not be allowed to sit in during the techniques portion of the class. If you are unable to bring a model please let us know in advance and we will help you find one. If you are interested in being a model for one of Pearl Lash training events, please visit our Models page to sign up for the wait list. We do not recommend using a mannequin head during the training, we prefer each student to receive an actual true life experience during the class. Performing an eyelash extension set on a mannequin has a significantly different feel than doing one on a real person. 5. Is the starter kit included for the eyelash extension classes? What about eyelash lift classes? The key fact that distinguishes Pearl Lash from most other training schools is our approach to product selection. While we do offer a wide variety of lash extensions and accessories that can be purchased on our website, a student will never be forced to purchase our eyelash extension products. We do not include the kit in our Classic Eyelash Extension and Volume Eyelash Extension classes cost in order to make the class more affordable and give each student the freedom to decide if to proceed with our starter kit (sold separately) or proceed with any other brand. Our Eyelash Perming with Keratin Treatment classes do include the kit in the cost of the training. The patented formula that we use for this application is only available through Pearl Lash. Our trainer will gladly take the time to explain the benefits and shortcomings of each brand upon your request and advise each student on the best way for them to proceed. 6. Do students receive discounts on your products online? Yes, each of our students will have access to special pricing on all the products posted on our website. Each student will be provided with a unique code to enter at checkout to activate their student discount as well as free shipping on all products with no minimum order! Pearl Lash offers a full line of premium eyelash extensions and accessories that each student will get to try and use during the training. 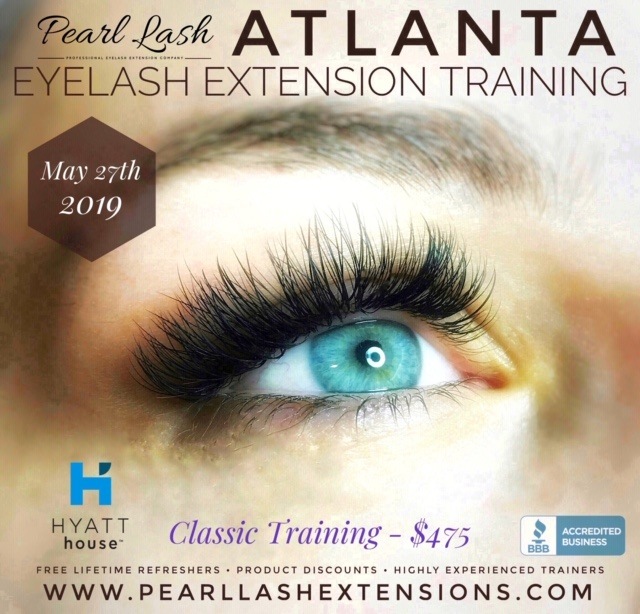 Your trainer will explain the benefits of various products and accessories during the training and it will be up to each individual student whether they choose to start their career with our Pearl Lash line of products or choose one of our competitors. 7. Do I receive a certificate upon completion? Yes, each student will receive a certificate of completion for each class they successfully complete. The certificate will be provided before you leave the training site in order for each student to take it home rather than wait for it in the mail. Please be advised that the Certificate Pearl Lash Extensions provides is not a state license and only certifies completion of the class. Before proceeding to work professionally in the state of Florida, you are required to obtain either a Cosmetologist, Full Specialty or Facialist (Esthetician) license. For regulations in other states, please check with your local board of regulations. 8. What if I still do not feel confident after the full day training? One for the key features the Pearl Lash offers is Free Refresher Training. When we say free, we truly mean free. Every graduating student has an option to retake the class they already completed. There is no limit to how many times this option can be exercised. In order to register for the Free refresher, a student must email our customer support team (info@pearllashextensions.com) preferably 4 – 6 weeks in advance of an upcoming class (you many monitor class schedule online and find a venue that is most convenient) with their request. Our agents will review the request and respond within hours to confirm the spot. Please note that even though we try to accommodate every single student request, refresher seats are limited to 2 for each event and are filled on a first come first serve basis. To be sure and get a spot in the specific venue and date of your choosing, please reserve the spot as far in advance as possible. If a spot at your desired location and time will not be available, an agent will provide you with several alternative dates for your choosing. 9. What happens if I need to cancel or reschedule after I registered? At Pearl Lash, we have a very lenient cancellation and class transfer policy. All we require is a 14 days advanced notice via email to our customer support team (info@pearllashextensions.com) before your scheduled training date. When writing a cancellation or transfer request email, please include your full name, contact information, the city you are registered for and the date of the class. If requesting a transfer, please indicate the venue and the date you would like your registration to be changed to. All refunds will be processed within 24 hours of initial request however may require between 3 – 7 business days (depending on your financial institution) to show up on your bank statement. Out of respect to our trainers, we do not accept any cancellation or transfer requests within the 14 day period before the class date. A lot of preparation and organization by each trainer goes into preparing for the event that begins several weeks in advance making last minute cancellations very disruptive. In an event of emergency within the 14 day grace period and you absolutely cannot attend the training, please do contact our customer support team and explain your situation. In an event of the true emergency, our customer support agent is able to elevate the case status to management where certain arrangements to transfer will be taken into consideration*. Please note that all requests must be made in writing and emailed to our customer support team. The complete Terms and Conditions statement is available on our website. 10. Is there a minimum age requirement to enroll in Eyelash Extension Training? The minimum requirement to attend Pearl Lash training is 16. Students between ages 16 and 18 will be required to have a written and notarized permission letter from their parent or guardian stating that he/she authorizes the student to attend the training. 11. What is the new Lash Lift w/Keratin Treatment Training all about? We glad you asked! Pearl Lash is extremely proud to roll out our new patented keratin treatment formula education. Many month of extensive research and product testing has gone into the curriculum to create a one of a kind training experience. Eyelash lift if an Asian trend that has been booming in Eastern and Western Europe as well as Asia for several years now and is just beginning to reach the US market. We have partnered up with a leading manufacturer as well as an experienced European trainer to bring you this exclusive training. In short, eyelash lift is an alternative to eyelash extension. There are many benefits to a potential client which are explicitly detailed in our post here. If you have any additional questions after reading this post, please contact us for more information. 12. Does Pearl Lash offer a payment plan or a scholarship? We understand that sometimes coming up with a full payment upfront might be challenging for most of us. For those reasons we have implemented a deposit system. Each student may register with just a $200 fully refundable deposit to secure a seat to any of our training events. The balance of the class will not be due until 7 days prior to your particular training date. Unfortunately, at this time we do not offer any scholarships or training assistance. If something changes in the future we will surely let everyone know about it. 13. I do not live in the US, can I still attend and get certified? Absolutely! 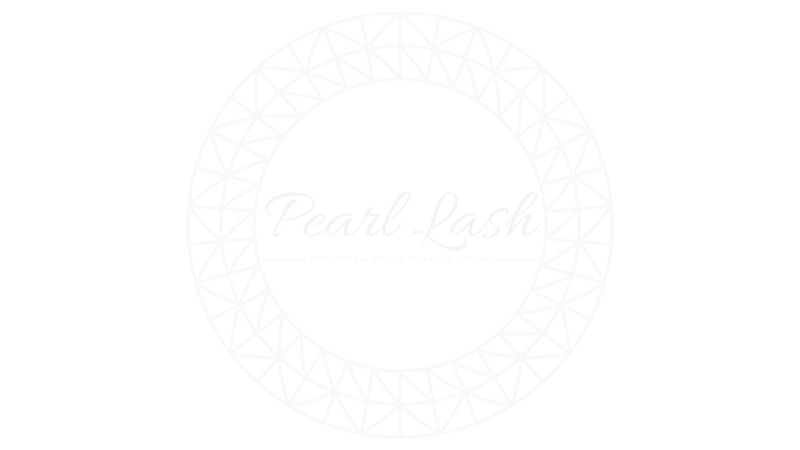 In fact Pearl Lash has certified students currently living in over a dozen different countries including Bahamas, Barbados, Jamaica, BVI, Canada, Poland, Mexico, Brazil, Russia and many more. Pearl Lash Certification is valid anywhere in the world and is an invaluable business card for any successful lash artist. We do highly recommend that you inquire on licensing requirements in your home country to make sure an additional government license is not required. From our experience, none of the countries in the Caribbean require any additional licensing and only some of the countries in South America and Europe require a separate license. 14. The training I wanted to attend is Sold Out, do you have a wait list I can sign up to? We always recommend registering and putting down a deposit for your desired training as early as possible as many of our classes do sell out well in advance. However, if you did not get a chance to register early and do see your desired class sold out do not get discouraged. Pearl Lash does offer a Standby list option that a student can join by clicking on the “Standby list” button next to the appropriate training date. You would fill in your email address and automatically get in line in an event for a cancellation. If a cancellation does occur, an automated email will be sent to the email address provided with registration instructions. Please note that the Standby entries are taken in the order they come in therefore there might be several student in front on the list where they will get the first chance to take that spot. 15. My friend and I are both coming to the training. Can we be the model for each other? As fun as it would be to practice on each other it would not be possible. Our hands-on portion of the class is conducted as a group which means all students will be working on their models simultaneously throughout the second part of the class. Students will not have an opportunity to swap places during the class. 16. Are we able to purchase products at the training event? Yes, our training event staff will have a number of Starter Kits and other accessories available for sale at the training venue. Your student discount will be applied towards all purchases made during the event. All major credit cards, apple pay and cash are accepted at the training. 17. Will one day of classroom training be enough, what if I need more? At Pearl Lash, we believe that there is nothing more valuable in our profession (or possibly life) than time. While most of us are able to take a day off and dedicate to training, spending two days away from your job and asking your model to take a full day off for you might be challenging. Early on, we made a decision to incorporate each of our training courses into a single day. We believe the required technical information and hands on training does not require more than a day when researching student testimonials. However, if any of our students do not grasp any portion of the class during the full day of training, we have a great option for you… Free Refresher Training! Pearl Lash has pioneered the first and only Free Refresher option in the SE United States! Coming in for a second day of training is absolutely free! Yes, you heard it right, Free! If you choose to extend your training from a one day to a two day, you are welcome to do so at No Additional Charge! You may do so right on the spot (during your initial class) or you may attend any of Pearl Lash future events, in any city, at any time. The best part is that the Free Refreshers are truly Unlimited! You may come in as many times as you like until you feel confident to proceed with live clients! 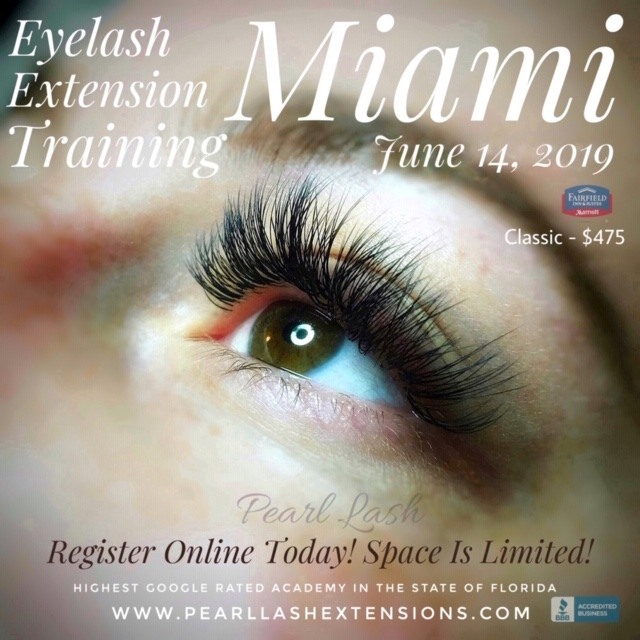 This concept of giving our students an option of how much time they need to spend in class, one day or five days, as well as providing each graduating student a direct line of communication with their instructor while practicing at home, is what has given Pearl Lash an A Rating from the BBB and propelled us to be the Highest Rated Eyelash Extension Academy in Florida! To Know More Please Read This Article. 18. Do you offer classes in Spanish? ¿Ofreces clases de español? At Pearl Lash, our professional training extends worldwide with many students from Mexico, Central and South America coming to US to receive Pearl Lash Certification. According to the rules of the department of regulations and the board of Cosmetology, all classes are conducted in English. However, in order to serve our Spanish speaking students, Pearl Lash has professionally translated Spanish Training Materials, Documentation and even provides an ability for Spanish speaking students to complete the Certification test in Spanish. This option is great for students who have difficulties understanding the English language and gives them a chance to receive all their information in Spanish. Please request “Spanish Documentation” during registration checkout and your instructor will have them ready for your class. En Pearl Lash, nuestra capacitación profesional se extiende a todo el mundo con muchos estudiantes de México, América Central y América del Sur que vienen a los Estados Unidos para recibir la certificación Pearl Lash. De acuerdo con las reglas del departamento de regulaciones y la junta de cosmetología, todas las clases se imparten en inglés. Sin embargo, para atender a nuestros estudiantes que hablan español, Pearl Lash ha traducido profesionalmente los Materiales de Capacitación en Español, Documentación e incluso ofrece una capacidad para que los estudiantes que hablan español completen el examen de Certificación en español. Esta opción es excelente para los estudiantes que tienen dificultades para entender el idioma inglés y les da la oportunidad de recibir toda su información en español. Solicite “Documentación en español” durante el proceso de registro y su instructor los tendrá listos para su clase.